Like a heartfelt embrace, this beautiful casket spray delivers comfort and love in an extraordinary way. 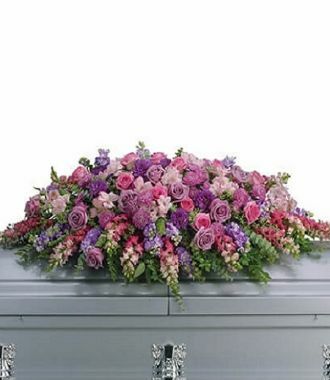 A wonderful array of lavender and pink flowers with just the right amount of greenery is a lovely way to pay tribute to someone who will always be with you in heart, mind and spirit. Lovely lavender and pink roses, snapdragons, alstroemeria, chrysanthemums, fern, eucalyptus and more create this tribute that is overflowing with grace and love.